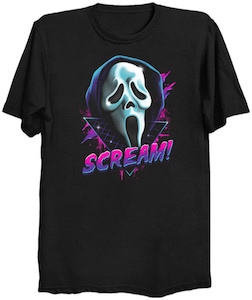 If you like dessert and the Scream movie then you just need this ice scream t-shirt. The t-shirt is an all over design and it is a unisex shirt so that both men and women can enjoy it. And this t-shirt is available in sizes XSmall – 2XL. And if you like a different style shirt then you are in luck as there are many styles including tank tops and hoodies. 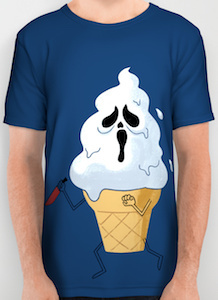 On the shirt, you can see a soft-serve ice cream and it has legs and arms and is holding a knife and the ice cream looks like the face of the reaper from the Scream movie which is the reason why this is an ice Scream t-shirt. I scream, you scream, we all scream for ice “scream”? Did I just read that right? What a great t-shirt that is a little deeper than just a saying and a picture of ice cream. 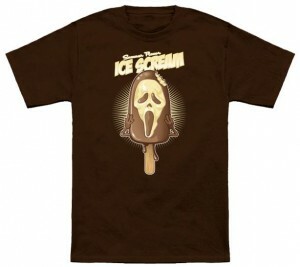 This brown crew neck t-shirt has a 60’s type style of print of an ice cream treat with the “Scream” mask. It says, “Summer Flavor, Ice Scream”. Such a good play on words. Men and women will enjoy this unisex t-shirt that has a full size range starting at a Small and goes up to a 2XL. It is made of 100% cotton that has been pre-shrunk to help with a lasting product. Chase that ice cream truck in your You Scream For Ice Scream T-Shirt.